Who Invented The Steamship? History Of Steamship - Biography of Robert Fulton. Inventor of Steamship - Robert Fulton. Robert Fulton is an American engineer and inventor who is widely praised for developing the first commercially successful steamers. In 1800 he was commissioned by Napoleon Bonaparte to design the Nautilus, the first in the history of practical submarines. Fulton was born November 14, 1765 and died on February 24, 1815). 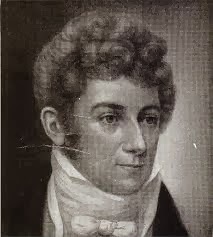 Robert Fulton was born on a farm in Little Britain, Pennsylvania, on November 14, 1765. He has at least three brothers - Isabella, Elizabeth, and Mary, and a younger brother, Abraham. His father, Robert, has become a close friend of the father of the painter Benjamin. Fulton later met in England and they became friends. Fulton lived in Philadelphia for six years, where he painted portraits and landscapes, homes and machines, and was able to send money to help support his mother. In 1785 he bought a farm in Hopewell, Pennsylvania for £ 80 Sterling and his mother and family moved there. While in Philadelphia, he met Benjamin Franklin and other figures. At the age of 23 he decided to visit Europe. In 1777 Fulton was interested in steamships, when he visited William Henry of Lancaster, Pennsylvania, who had previously learned about the James Watt steam engineon a visit to England. Henry then made his own machine and in 1767 he had tried putting the engine into a boat. The experiment failed because the ship sank, but his interest continued. In 1786, Fulton went to study painting in Paris, and there he met James Rumsey, who sat for a portrait in the studio of West Benjamin where Fulton was a disciple. Rumsey was an inventor from Virginia who manages his own first steamship in Shepherdstown (now in West Virginia) in 1786. 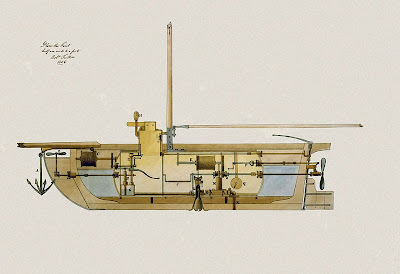 In early 1793, Fulton proposed a plan for steam-powered vessels both the United States and the British government, and in England he met with the Duke of Bridgewater. Symington had managed to try a steamboat in 1788. The first successful experiment started from a steamer devised by inventor John Fitch on the Delaware River on August 22, 1787, in the presence of a delegate from the Constitutional Convention. This is driven by banks of paddles on both sides of the ship. The following year Fitch launched a 60 foot (18 m) boat powered by a steam engine. Pedal this paddle in a manner similar to the movement of a duck leg in a pond. With this boat he carried thirty passengers on various round-trip trips between Philadelphia and Burlington, New Jersey. On August 26, 1791 Fitch was granted a patent after going through a dispute with Rumsey, who had created a similar invention. In 1797, Fulton went to France, where Claude de Jouffroy had built a steam wheel. in 1783 began experimenting with torpedo submarines and torpedo boats. Fulton is the inventor of the first panorama to be shown in Paris, which was completed in 1800. The way in which the panorama is shown is still called "'Rue des Panorames'" (Panorama Street) now. 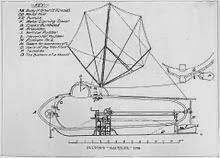 While living in France Fulton designed the first submarine, Nautilus between 1793 and 1797. He asked the government to subsidize its construction but he turned it down twice. Finally he approached the Minister of Marine Affairs and in 1800 was given permission to build. In France Fulton met with Chancellor Robert R. Livingston who was appointed as US ambassador to France in 1801, and they decided to build a ship together and try to run on the Seine. Fulton experimented with water resistance from various forms of stomach, creating drawings and models, and building steamships. At first the boat ran perfectly, but the hull was then rebuilt and reinforced, and on August 9, 1803, the boat drove up the Seine River. The boat was 66 feet (20.1 m) long, 8 feet (2.4 m) beam, and made between 3 and 4 miles per hour (4.8 and 6.4 km / h) against the current. In 1807, Fulton and Livingston jointly built the first commercial vessel, Steamboat River North (later known as Clermont), carrying passengers between New York City and Albany, New York. Clermont is capable of traveling about 300 miles on a journey of 62 hours. From 1811 until his death, Fulton was a member of the Erie Canal Commission. Fulton died in 1815. He was buried at the Trinity Church Cemetery in New York City, along with other famous Americans such as Alexander Hamilton and Albert Gallatin. 0 Response to "Who Invented The Steamship? History Of Steamship - Biography of Robert Fulton"